As a professional non-linear editing software application, Final Cut Pro is the first choice of professional editors. Whether you're working solo or collaborating with a team, Final Cut Pro gives you more creative options and technical control. Though Final Cut Pro is able to import and edit any QuickTime compatible video format, camera-native formats, even Apple ProRes, there is still limitation in importing AVI, WMV, MP4, YouTube video to Final Cut Express/Pro, let alone to edit those kind of video formats. This following will introduce a step by step guide on how to successfully import video to Final Cut Pro (including Final Cut Pro X and Final Cut Pro 7) or Final Cut Express no matter what format the video is. This guide will need the following two parts to achieve. Free download FCP Converter-Bigasoft Total Video Converter for Mac, install and run it. Bigasoft Total Video Converter for Mac, the professional Final Cut Pro Converter, is specially designed for Mac users to easily convert various video formats to Final Cut Pro or Final Cut Express compatible DV format such as YouTube to Final Cut Pro/Express, MP4 to Final Cut Pro/Express, AVI to Final Cut Pro/Express, WMV to Final Cut Pro/Express and more. Click "Add File" button to import your video file (which can not be imported to Final Cut Pro including MP4, MKV, AVI, MPEG, Xvid, DivX, H.264, 3GP, WMV, FLV, MOD, TOD, WebM, VP8 and more) to the Final Cut Pro Converter-Bigasoft Total Video Converter for Mac. Or you can also drag your video file directly to the main interface of Bigasoft Total Video Converter for Mac. First click the drop-down list of "Profile", then choose DV - Digital Video format (*.dv) from "General Video" Category. To import video to Final Cut Express, setting output format as MOV or MP4 will be recommended. To import video to Final Cut Pro, it is also feasible to set output format as Prores Video(*.mov), but this format may take much more spaces than other video formats. Press "Convert" button to convert video to Final Cut Pro supported DV format. It will be finished in few minutes. First start Final Cut Pro, then choose File > Import > Files... at the top of the Final Cut Pro window. Select the converted file in part one from the standard Choose a File window. After the file is located and highlighted, press the "Choose" button. Locate the file in the resources list for the project, it appears there just as any captured video would. Manipulate the video file in the Viewer Slug window as necessary. Drag the file into the Timeline when ready. The footage needs to be rendered before it can be viewed in the Canvas. Save the project. Render the Timeline so that the video can be seen. It is easiest to render both audio and video at this time even if the video imported had no audio. It may take several minutes to render the footage. Save the project again. The video can now be edited in the Timeline as if it were normally captured video. With the above tutorial, importing video to Final Cut Pro is never so easy! You can not only edit footage captured in such popular video formats as DV, HDV, P2 MXF (DVCProHD), XDCAM and AVCHD, but also edit video clips such as downloaded web content or even archived video from the hard drive by converting and importing YouTube to Final Cut Pro, MP4 to Final Cut Pro, AVI to Final Cut Pro, WMV to Final Cut Pro, iMovie to Final Cut Pro, MOD to Final Cut Pro with the smart FCP Converter. Final Cut Pro is a professional non-linear editing software application developed by Macromedia Inc. and then Apple Inc. The latest version is Final Cut Pro 7 which runs on Mac personal computers powered by Mac OS X version 10.5.6 or later and using Intel processors. The software allows users to log and capture video onto a hard drive (internal or external), where it can be edited, processed, and output to a wide variety of formats. Compared with iMovie, it is more powerful and professional. What is Final Cut Express? 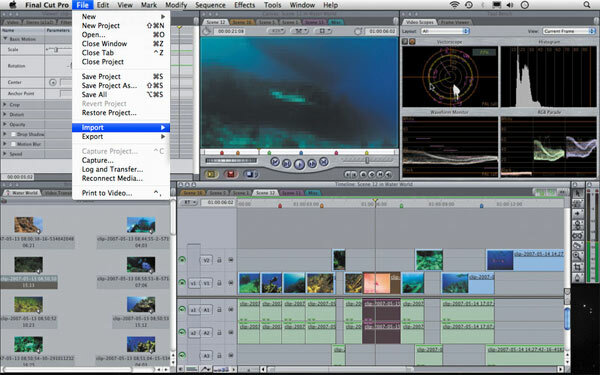 Final Cut Express is a non-linear video editing application created by Apple Inc. It is the consumer version of Final Cut Pro and is designed for advanced editing of digital video as well as high-definition video, which is used by many amateur and professional videographers. Final Cut Express is considered a "step" above iMovie in terms of capabilities, but a "step" underneath Final Cut Pro and its suite of applications. The latest version is Final Cut Express 4 which now supports the latest AVCHD cameras, features an open format Timeline, provides iMovie '09 compatibility, and offers sophisticated effects and filters.